1.Preheat oven to 300°F. Cut brisket in half crosswise if necessary to fit into large roasting pan or Dutch oven. Rub brisket with 2 pouches onion soup mix. Heat pan over medium heat until hot. Add oil and heat until hot but not smoking. Add brisket and sear all sides until browned; place brisket, fat side down, in pan. 2.Add carrots, bay leaves, tomatoes, onions and crushed red pepper to pan. Pour beer over brisket. Cover pan tightly with lid or foil. Roast brisket 4 to 5 hours until fork-tender. 3.Remove and discard bay leaves. 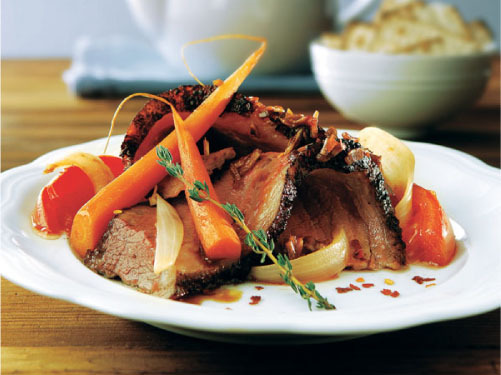 Remove brisket and vegetables from pan; keep warm. Skim and discard fat from pan drippings. Strain pan drippings into a medium saucepan. Simmer over medium heat 25 minutes. Remove saucepan from heat; add butter and stir until melted. Place brisket on cutting board and slice across the grain. Serve with vegetables and sauce.